My first encounter with Firestorm was in my first reading of Identity Crisis... when he died. I later got to know him better when I read Crisis on Infinite Earths. While he was never what you would call an A-list superhero in the DC Universe, Firestorm was popular enough to rate a couple of solo comic runs and a figure in the 1980s Super Powers line. I suspect this latter fact helped get him into DCUC so early. High school student Ronnie Raymond and physicist Martin Stein found themselves bonded at the atomic level when a terrorist bomb blew up Stein's lab. Able to rearrange matter at the molecular level, Raymond and Stein's united alter ego Firestorm battle injustice. While Ronnie was the physical body, Stein provided sage counsel and scientific advice as a disembodied spirit. The sculpt is on par with the rest of the line - which is to say, very good. However, this figure was intended to be the modern Jason Rusch version of Firestorm, and was retooled to be the Ronnie Raymond version. 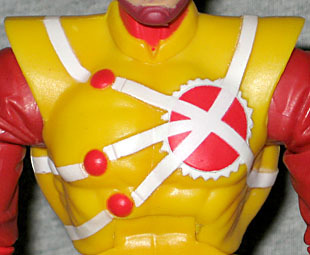 Usually for variants, Mattel and the Horsemen re-sculpt all the parts of the figure that differ from the regular version, but in this case they left the Rusch gloves (which are yellow all the way to the end of the forearm) intact. Ronnie's gloves were a bit smaller. I'm not enough of a fan of Firestorm to care about it, but I imagine it will matter to someone. The original prototype sculpt had Ronnie's mouth yelling, but Mattel and the Horsemen wisely re-sculpted it with a closed mouth. The reason a closed mouth is preferable is because it can serve as a "default" look for a character, meaning one is free to imagine that character as being happy or sad, angry or calm. If the mouth is opened in a yell, he's going to look a little odd in a diorama of the Justice League sitting around in a meeting, as if he's shouting at everyone like Billy Mays. One noteable item - Ronnie's flame-hair. I've rarely seen flames done on an action figure as well as the Horsemen have done here. I'm impressed by good the flames on the head look. I've never been sure that translucent plastic was the best way to portray three-dimensional flames on an action figure; it runs the risk of looking more like a lollipop. But Firestorm has one of the best implementations of this I've come across, thanks largely to the Horsemen's intricate detail work on the flames. Like Red Tornado in series one, Firestorm has the most "toyish" look and feel of the wave. 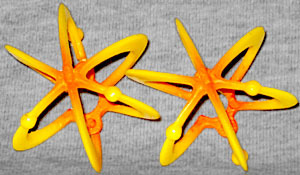 The bright red and yellow, while accurate to the source, looks and feels like the plastic it's made from; and while there's a light wash on the red areas, there doesn't appear to be one on the yellow parts. However, the paint applications on the face and chest details are very well done, particularly the intersecting white lines over the right breast. 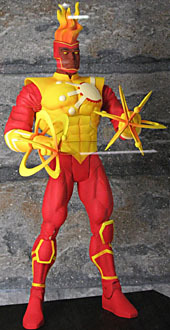 Firestorm has the standard DCUC articulation: balljoints at the neck and shoulders, hinge joints at the elbows, knees, ankles and abdomen, the post/hinge joints they love so much at the hips (for balljoint-style range of motion without the big round ball), and swivel joints at the wrists, biceps, thighs and waist. There will be a variant version of this figure featuring Jason Rusch, the current Firestorm and Ronnie's replacement (introdued in 2004), but it has yet to hit stores - look for it in the second wave, which was delayed because Mattel switched factories mid-way through the prodction run. Since he can rearrange matter and project powerful beams of nuclear energy, Firestorm doesn't really need to carry any weapons. It would all be rather pointless, of course, since any weapon he could carry would be weaker than he is himself. To that end, his only pack-in is Grodd's right leg. But the figure does feature two removable "molecular" attachments for his hands. They resemble an elementary school textbook's image of a molecule, and they even have a slight orange wash on them. Again, despite my skepticism of three-dimensional representations of things like flames and energy, I'm impressed by how well the Horsemen make it work.